TS Eliot – The Sacred Wood, A Dissertation. “I have read your work on The Sacred Wood carefully and enjoyed reading it…I myself think that this is an excellent commentary.” Dr. Amalendu Bose, D. Phil. (Oxon. ), F.I.A.L., Sir Gooroodas Banerjee Professor & Head, Department of English, Calcutta University. A valuable little book…very useful, totally unpretentious and well written. Your power of concentration on the subject is admirable. With your writing ability you will, I feel, turn in due course to other subjects and authors as well, both old and new.” Dr. A. N. Kaul, Head, Department of English, Delhi University. “I have gone through your work with much interest and have been much impressed by your methodical exposition and your very clear analysis of Eliot’s thought. This is what critical appraisal and analysis should rest on; otherwise criticism, however good, so easily passes into myth for the next generations which their successor have in turn to pull down. Thank you very much for giving the opportunity to see your worth.” Dr. T.G.P. Spear, Fellow, Selwyn College, Cambridge University. An extraordinarily well-informed, sympathetic and useful dissertation…In fact, for the general reader this is probably the best organised book on Eliot’s criticism, the appendices being products of much thought and sensitivity. Mr. Bhattacharya has five topics that will be specially useful to university students…It is encouraging to see an alert mind not unafraid to tell off grey eminences like Sean Lucy, Eliseo Vivas and Kristian Smidt where they seem to go wrong in their understanding of Eliot’s meanings. 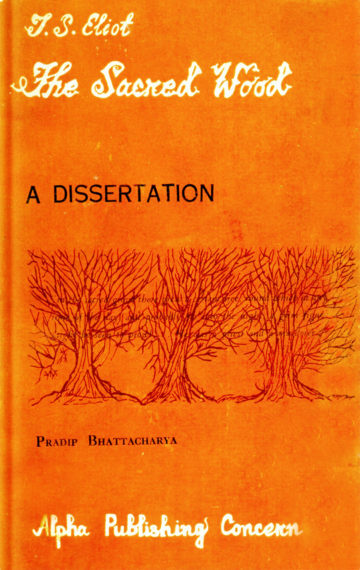 Mr. Bhattacharya’s work is not, as most books of this nature are, a re-hash of available material on the subject. There is much original thinking in it–and many new viewpoints on clichéd areas. For instance, Watson apart, no one has so far explained the title of the book. Mr. Bhattacharya suggests that this is sacred grove at Nemi near Rome…Eliot’s murderer in ‘the bloody wood’ has not yet appeared on the scene; and acolytes of Mr. Pradip Bhattacharya’s devotion will not doubt prevent the guru’s stiff shroud from being dishonoured.” Padma Sri Prof. P. Lal in The Hindusthan Standard. “I have read (it) with interest and profit. Sri Bhattacharya’s writing shows a good deal of critical penetration and intelligent understanding of complex and difficult ideas of a book which still remains a basic work on modern criticism. I am particularly impressed with Sri Bhattacharya’s wide reading in Eliot’s prose and poetry and in the large Eliot literature. The dissertation gives a careful and minute analysis of the major chapters of the book and follows up with a series of appendices of a more general nature, all bearing on Eliot’s fundamental ideas. These show a critical maturity which is rare indeed. In spite of its modest compass the book will be of great help not only to students but to those also who are interested in Mr. Eliot’s work as poet and critic.” Prof. Amal Bhattacharji, Head, Department of English, Presidency College, Calcutta.